BOOSTING YOUR BASICS by One Handed Cooks. Making the most of every mealtime – from baby to school age. It’s here! Our new book baby has arrived. It’s been a long time in the making and we are super proud to take a sneak peek into our new cookbook and share 2 of our many favourite recipes with you. 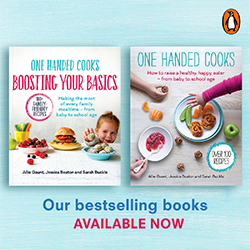 Boosting Your Basics is a follow on from the best-selling success of our first book, One Handed Cooks: How to raise a healthy, happy eater from baby to school age. 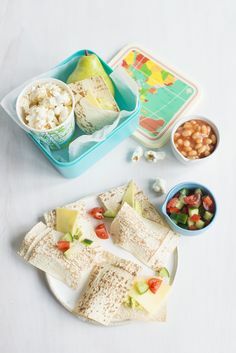 In it we highlight everyday meals and snacks families know and love and show you easy substitutions and additions that can boost the nutrient content in a simple, delicious and healthful way. With our own growing families we’re also focusing on the shared family meal and how important this is to be able to role model positive eating behaviours as well as tune into our childrens’ eating preferences to help expand the variety of foods they eat and enjoy. 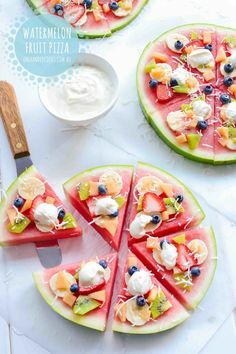 Among the 100+ new recipes – baby food, finger foods, nourishing sweet and savoury snacks, meals to encourage meat acceptance, vegetarian meals, meals to suit the whole family from baby to adult, party food plus lunchbox additions (phew! we cover a lot!) – we tackle fussy eating from a few angles. We know each child is so different and so is the way they like to eat, or the reason why they refuse food. 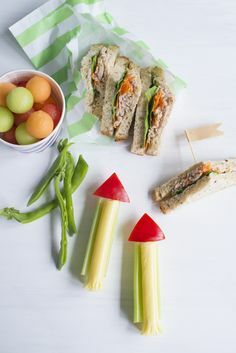 So from engaging in sensory pre-mealtime activates, slowly and sensitively stretching children from a few select foods they enjoy to meals that are textured and flavourful as well as the much loved tasting plate approach we have something for everyone. So please enjoy these two recipes on us and we wish you lots of happy cooking and happy eating! 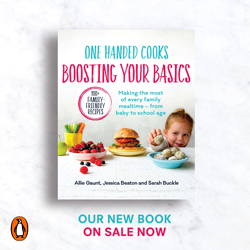 Boosting Your Basics (2019) published by Penguin Random House Australia is available in all good bookstores and online.